Scottish software company Gael Ltd unveiled their ambitious plans for the future during a special visit to their East Kilbride premises earlier this month. The Lanarkshire-based company welcomed Jim Mather, the Scottish Government’s Enterprise, Energy and Tourism Minister, to their base at SE Technology Park as they revealed a number of exciting business projects. Mr Mather, MSP for Argyll and Bute, has long been an advocate for Gael’s sister company’s self-titled mind mapping software MindGenius, actively using it to help facilitate the many national conversations he has hosted with industry, trade and public bodies throughout Scotland. During his visit to Gael’s Orion House premises in East Kilbride, he witnessed firsthand the success of the company’s flagship compliance management software, Q-Pulse, in domestic and international markets. Gael’s Managing Director Donald Maciver said: “We were delighted to welcome Mr Mather here as he has been an avid user of MindGenius for a number of years now, essentially as he finds it ideal to easily capture, analyse and feedback dialogue at events designed to help organisations and individuals work together to improve their effectiveness. Although he had experience of MindGenius, we felt it was important for Mr Mather to see the size, growth and potential of Gael Ltd as a company. Q-Pulse helps organisations manage compliance and is particularly dominant in aviation and healthcare sectors in both the domestic and international marketplace. Gael currently employs 93 staff in East Kilbride having added 22 staff in the last year despite the global economic climate and expects to have over 100 employees by April 2011. During his visit on Monday, September 13, the Enterprise Minister was taken on a tour of Gael’s premises before being briefed on the company’s products and ambitious plans for the future which includes plans for operational bases in the US and Dubai. Mr Mather is one of few MSPs who ran their own business prior to being elected at Holyrood and he admitted he was impressed by Gael’s set-up and future business plan. Nathan Phillips is Assistant Electoral Officer with Elections New Brunswick in Canada. He uses MindGenius to prepare his annual work plan, to initiate special projects, to prepare training programs for new employees, and to prepare manuals for use in an election. For example, the annual work plan identifies key responsibility areas of each senior staff person and lists the ongoing tasks and special projects within each area. Training programs for new employees are built from the work plan, thus ensuring that all tasks and projects are incorporated into the training program. Traditionally, Nathan used MS Word to draft documents. However, while working with the Office of the Auditor General of New Brunswick, he discovered mind-mapping. Using this new concept and MindGenius software, he revolutionized the process of drafting value-for-money audit reports. MindGenius allows him to more efficiently gather thoughts at the beginning of a project. It also ensures completeness of content in any project or document and to better define the scope of any project. For the provincial general election that took place on September 27, 2010, tasks for all staff members were identified in a series of brainstorming sessions and consolidated in one large mind map. This map was then exported to MS Project for managing the election process. For more information on the election, visit http://www.electionsnb.ca/. Following on from last month’s announcement that MindGenius were releasing 2 new training courses, these courses are now available to book. Training is delivered over the web for small groups of 2-4 people in 2 hour sessions, and is priced at £500 for 2-4 attendees. Attendees will develop an understanding of the underlying concepts of MindGenius through to the essential functionality required to ensure you make the most of the application. The course will focus on more advanced applications of MindGenius such as task management, categories and filtering, project management using the Gantt view, preparing maps for exporting to MS Office applications and more. Each session can be customized to suit you or your team’s requirements. If you would like to book one of the courses, or discuss your training requirements with us, please contact us at info@mindgenius.com. For those in the Academic sector, who would like to see MindGenius in action, iansyst, our UK Education partner, will be demonstrating MindGenius at two upcoming events. The first event is the Scottish Learning festival, 22-23rd September 2010, at the SECC, Glasgow where you can receive a free demo on the iansyst stand on how MindGenius can help you and your school. The Scottish Learning Festival is organized by Learning and Teaching Scotland, a public body sponsored by the Scottish Government and offers seminars, exhibition and discussion zones, and this year will include a focus on the new Curriculum for Excellence. If you have missed, or are unable to attend this event, Iansyst will also be attending Special Needs London 2010, an event 100% focused on Special Needs, on Friday 15th and Saturday 16th of October at the Business Design Centre in London, on Stand ICT31, and will also offer free MindGenius demos at this event. For more information on iansyst, visit: http://www.iansyst.com/, or to find out more on how MindGenius can help in Education, watch our short video on our YouTube channel. There are many different techniques used to try and generate new ideas in a brainstorming session, one of these is to use a timer, ie set a time limit on a brainstorming session. Allocating a specific amount of time can focus attendees’ attention, be seen as a challenge to generate more ideas and can also help make sure you don't spend too much time on one topic. On the flip side, for some attendees, it can also be seen as a negative, as it may lead to panic and a mental block, limiting the number of ideas produced. However, this can be overcome by using a timer just to get you started, or by breaking your session down into different time intervals, which prompts you to move you through the sessions and cover all of the areas you need to, rather than spending too much time on one or more of the sections. 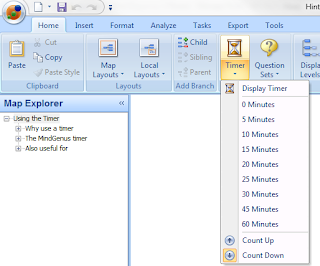 The MindGenus timer can be accessed via the Home ribbon and can be set to time down for setting a time limit on the session, or up, to show the elapsed time so far. Once selected, it is always displayed for the time you specify, even if you switch to full screen mode. 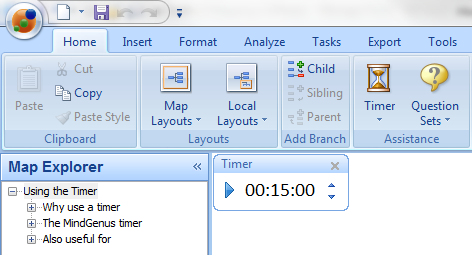 As well as brainstorming, the timer can also be useful for allocating a set period of time to get those tricky tasks started, or to overcome procrastination. Do you use the timer? Do you use it for any other purpose? With the new term having started, or just about to start for many students, it’s a good time to consider your study techniques for the year ahead. It’s a well-documented fact that mind mapping can help with memory recall and one student who is using MindGenius to help with her study techniques, as well as preparing her assignments is Catherine Garton. Catherine is a student at Southampton University one day a week, studying “Working with Children” and she also works four days in a primary school setting as a support teacher and Learning Support Assistant. Catherine uses MindGenius for all her assignments and one she is currently working on is 'Developing the skills for your working role'. Catherine used MindGenius to focus on and highlight all of the areas she needed to cover within in the assignment. This helped her ensure she included everything she needed to as the assignment was split into different sections and using mind mapping Catherine could focus on each section in turn. In the past, Catherine would have used a pen and paper to undertake her tasks and studying. Revision notes would often have to be updated or added to as she developed new knowledge which meant paper based notes often had to be recreated from scratch. 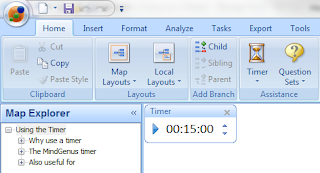 Using MindGenius allows Catherine to create her study notes far more quickly and she is able to edit and amend them at any point. Catherine thinks the biggest benefits of using MindGenius are being able to see clearly and quickly what needs to be done and what areas she has completed and when, which allows her to be more effective at time management. In addition, MindGenius also allows her to quickly create and amend different maps for specific tasks and university assignments, and print copies of the maps she’s produced to share with work and study friends. Sharing her ideas in this way, means it is easier for everyone to understand the topic. Hywel Wilson, from PeopleProfitPlanet UK Ltd has been using MindGenius since 2004 when he purchased it to brainstorm a new Sales Strategy. PeopleProfitPlanet enables organisations to reduce costs by providing environmental business solutions. These solutions typically involve delivering strategy, implementation and training so that clients gain benefits ranging from compliance to competitive advantage and the ability to enter new markets. 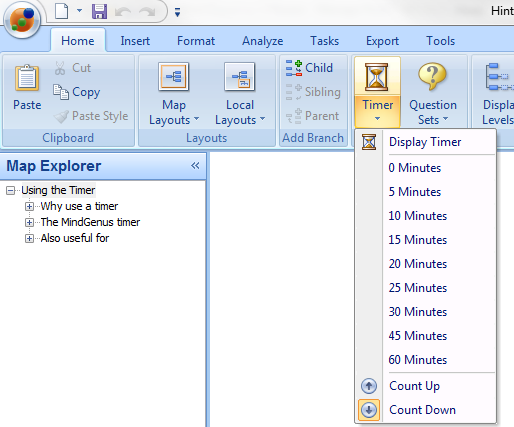 Hywel uses MindGenius for idea creation - either personally or in a group brainstorming session with others. Before finding MindGenius, he would have used paper or PowerPoint in outline mode to undertake this task, however Hywel feels these methods are not as easy to manipulate, and don’t allow you to see the whole picture clearly. MindGenius has allowed for more efficient brainstorming, clearer strategies, and the recognition of links and similarities between ideas that they may not have found otherwise. Recently, he used the organizational chart feature in MindGenius 3 to articulate organizational structure changes which were then manipulated in discussions with other until all were happy.